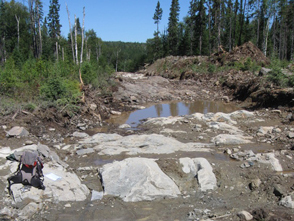 The Mosseau project is comprised of 68 claims for 31.3 square-kilometers located 22 kilometers east of the town of Lebel-sur-Quévillon, in the Abitibi region of Quebec. It is considered to be highly prospective due to the presence of an historic mineral resource of 317,700 tonnes grading 3.4 g/t gold known as the Morono ‘’M zone’’, as well as several gold showings and drill intercepts associated shear zones that can be traced over a strike length of more than 10 kilometers on the project (the Morono ‘’M zone’’ resource is historical and should not be relied upon as it was not prepared under NI 43-101). Mosseau is surrounded by Osisko Mining’s claims to the south and east, as well as Soquem’s Verneuil project to the northwest and Cartier Resources’ Wilson project. 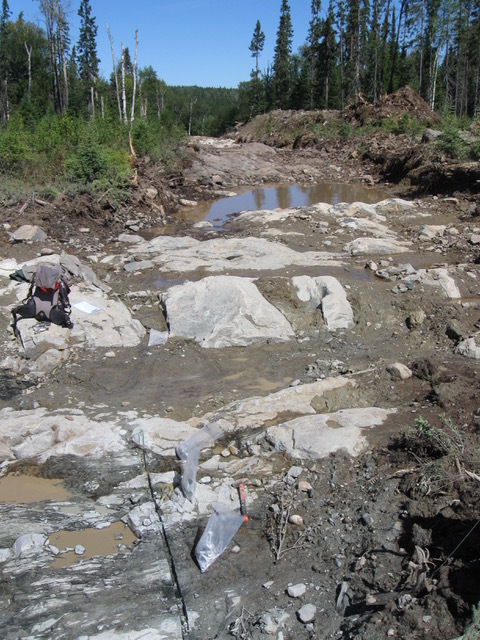 Gold mineralization on the project is associated to shear zones mostly oriented parallel to the northwest – southeast trending stratigraphy at the near contact between the intrusive rocks of the Wilson pluton and the volcanics to the south. The mineralization at Morono ‘’M zone’’ appears in quartz-sericite schists with disseminated pyrite along a continuous 950-meter long shear zone of 5 to 15 meters in thickness. All historical drill holes at Morono ‘’M zone’’ have cross-cut the shear zone, including one the deepest drill intercept at 270 meters grading 4.42g/t gold over 5.84 meters (true width, hole M4-88). A series of parallel shear zones located several hundred meters away from the ‘’M zone’’ referred as the ‘’R, P and S zones’’ have returned historically drill cuts respectively up to 1.7 g/t gold over 1.04 meter, 138 g/t gold over 0.46 meter, and 17.5 g/t over 0.91 meter. 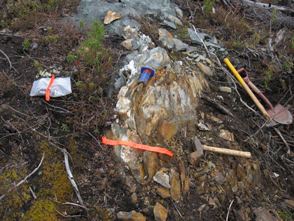 Two kilometers to the south, the Kiask River fault zone is oriented parallel to those from the Morono area and hosts gold showing up to 12.1g/t gold. The Company completed the drill program in November 2017, where 9 holes were to test several IP targets, most of which were oriented parallel to the Kiask River Fault Zone, with the other four 4 holes geared to test the extensions at depth of the Morono ‘’M Zone’’ gold deposit. A new gold zone was intersected in hole MO-17-10 that targeted an IP chargeability anomaly located 800 meters northwest and on-trend with the KC-1 surface showing where a selected rock sample returned 12.1 g/t Au. These are located north and parallel to the northwest-southeast-trending Kiask River Fault Zone that crosses the Property. Hole MO-17-10 intersected 1.13 g/t Au over 14.5 meters (40.0 to 56.0 m core length), including 2.93 g/t Au over 4.53 meters, including an interval of 7.41 g/t Au over 0.91 meter (assays are reported in true thicknesses). This new mineralized zone is encompassed within sheared mafic volcanic rocks moderately to strongly altered in biotite, chlorite with local silicification, and containing up to 1% veinlets and fine-grained sulphides. Hole MO-17-11 located 100 meters east of the KC-1 showing and along the same IP axis intersected 0.46 g/t Au over 6.93 meters (43.0 to 52.0 m core length). 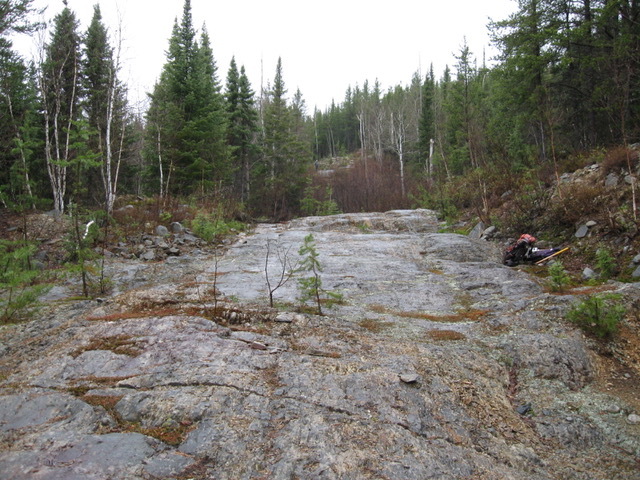 The discovery of this new gold zone opens a significant prospective area with a minimum strike length of 900 meters that remains largely unexplored and open in all directions. 3 of the four 4 holes drilled at the Morono ‘’M Zone’’ succeeded at intersecting the zone at a depth between 300 and 350 meters. The best result obtained from the Morono ‘’M Zone’’ was in hole MO-17-03 with 0.36 g/t Au over 2.39 meters. Several other gold intercepts associated with parallel shear zones to the Morono ‘’M Zone’’ were cut as well, one of which intersected 0.43 g/t Au over 2.87 meters in hole MO-17-02. Historical drilling at the Morono deposit has shown that the gold mineralization is not evenly distributed and additional drilling is required in order to determine a better representation of its potential. 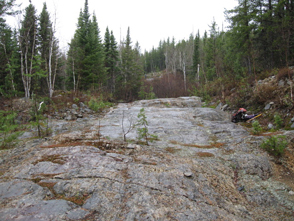 The Mosseau project was acquired by Vior in March 2017 by the map designation of 39 claims, the purchasing of 11 claims and the signing of two option agreement to acquire 100% interest in 15 claims, 9 of which from Les Ressources Tectonic and the other 6 claims from a prospector’s syndicate.